BEA Lasers introduces two new low profile additions to their rugged MIL Series of laser diode modules. The MIL RA and MIL Compact Series Laser modules are typically used for alignment and leveling applications. The new MIL RA Model features a right angle, and the new MIL Compact Model features a straight housing. Both laser modules are ideally suited for applications with limited space and tight positioning requirements. The industry’s first right angle rugged laser system, the MIL RA is a laser diode module with a 3/8” brass, nickel-plated laser housing that only occupies 1.5” of valuable space. The MIL Compact is a low profile laser diode module that occupies 1.5” of space, a much smaller profile then other lasers intended for industrial applications. The MIL RA and MIL Compact Series Laser modules are typically used for alignment and leveling applications. They are ideal for counting, machine vision, edge detection, paper web, riveting and water jet cutting alignment, to name just a few. 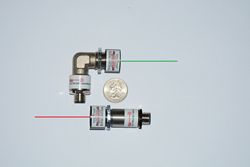 The MIL RA and MIL Compact Laser Series are offered in direct diode 635nm (Red), or 515nm (Green) lasers. The direct diode 515nm (green) and 635nm (red) design provides a compact, durable laser that will perform reliably under the most adverse industrial conditions. Compared with traditional 532nm green laser diode modules, the 515nm features low power consumption, along with a wider operating temperature / tolerance and greater stability. Custom variations can be provided by BEA Lasers to these new laser modules. Customization includes laser pattern options (lines, crosses, dot patterns, etc. ), flash options, other outputs and more. The new standard MIL Series Laser modules are now immediately available from inventory held at the BEA Lasers facility in Elk Grove Village, IL. This central location allows BEA Lasers to ship from stock within 24 hours, with custom options taking 4 weeks additional.